In 1939, the owners of Upton House, the Bearsteds, moved out of their family home near Banbury and their family owned Bank moved in. Driven by the need to protect staff and assets from the London air raids, M. Samuel & Co., moved in lock, stock and bought ledger, for the duration of the Second World War. On March 27th 2015, a new exhibition celebrating this wartime story was opened for the first time. 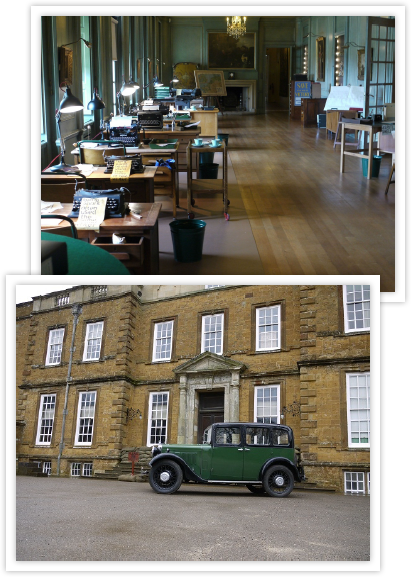 Banking for Victory, marks a complete transformation of Upton House, and asks visitors to join in the story and step back in time to see how the bank staff lived and worked in their new surroundings. There are office desks and typewriters in the Long Gallery alongside the world class paintings and porcelain collection, just as there were in the 1940s. New rooms are open, the gardens are enhanced with wartime features and visitors can explore what happened when ordinary people took over this extraordinary place. 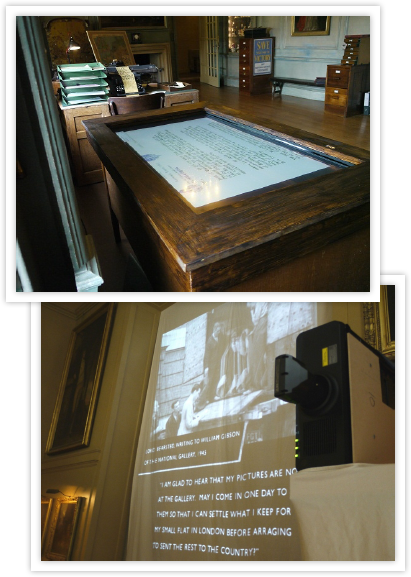 Panasonic has helped bring the exhibition to life, by providing high resolution projection and display technologies that add interactivity, atmosphere and movement to the new exhibition at Upton House. Panasonic technology is helping visitors to imagine what it would have been like to live and work at the wartime bank. The family dining room is used to create a stirring entrance. Neville Chamberlain's pronouncement that Britain was at war is mixed with Pathé footage projected on to the ornate ceiling. The result is achieved using a Panasonic PT-RW630, the world’s first laser light source 1-CHIP DLP projector and an ET-DLE030 ultra-short throw lens. Both are inverted and concealed within the fireplace, to create a 10m wide projection on the dining room ceiling. It's evocative of a wartime view of the clouds, seen through an air raid damaged roof. “We wanted the ceiling projection to create a reaction so that people don’t realise where it was coming from or what to expect. It has certainly achieved that,” added Rachael O’Connor-Boyd. In the long gallery, an interactive touch screen will bring to life the stories of what M. Samuel & Co. was doing for the war effort. The 50” LFB70 allows up to six simultaneous touch points. Integrator Arty Bon Bon Design has placed the screen on to a period desk with a wood panelled finish to ensure the technology does not look out of place with the surroundings. Similarly sympathetic design, has seen a projector fitted to Lady Bearsted’s four-poster bed, used to back project video content of her wartime story on to a calico cloth draped across the frame of the outer frame. In the adjacent dressing room, a PT-RW330 laser projector is also used to animate the story of Lord Bearsted’s work in the Special Operations Executive. In the family’s Picture Room, the 6,500 lumen Panasonic PT-RZ670 laser light source projector, with the ET-DLE030 ultra short throw lens, is being used to create a 17m projection on to a calico cloth draped across the window bay area. Finally, a PT-RZ370 laser/LED hybrid projector is used within a marquee in the grounds to create an authentic Wartime Cinema. The high brightness of the projector means, even during daylight hours, the Pathé footage is able to engage visitors of all ages. Banking for Victory is just one of the ways Panasonic is working with the National Trust to help it bring its properties to life and enhance the visitor experience. Panasonic’s renewable and energy-saving technologies are also enabling the Trust to achieve its goal of moving towards a greener, more sustainable mode of operation.